Georgy Alexeyevich Ushakov (Russian: Георгий Алексеевич Ушаков) (17 (30) January 1901 – 3 December 1963) was a Soviet explorer of the Arctic. Ushakov broke new ground when he surveyed and explored Severnaya Zemlya, together with four other Arctic explorers, establishing that it was an archipelago. He was honoured by being named Doctor of Geographic Sciences in 1950. In 1926, Ushakov founded the first Soviet settlement on Wrangel Island (today called Ushakovsky) and was its head for three years. In 1930-1932, Ushakov headed the Severnaya Zemlya expedition and established a polar station called Остров Домашний (Domashniy Island). In 1935, Ushakov led the first Soviet high-latitude expedition on an icebreaker Sadko. The cruises of the Sadko went farther north than most; in 1935 and 1936 the last unexplored areas in the northern Kara Sea were examined and the little Ushakov Island was discovered. In 1937 the ship was caught in the ice with two others and forced to winter in the Laptev Sea, adding valuable winter observations to the usual summer ones. 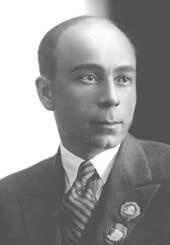 In 1932-1936, Georgy Ushakov was employed at the Chief Directorate of the Northern Sea Route (Главное Управление Северного Морского Пути). Ushakov then worked at the Chief Directorate of Hydrometeorological Service of the USSR (1936-1940) and Soviet Academy of Sciences (1940-1958). Ushakov died in Moscow, but was buried on Domashniy Island in Severnaya Zemlya. Mountains in the Antarctica, a spit and a cape on Wrangel Island, as well as a river on October Revolution Island bear Ushakov's name. But perhaps the greatest honor was that Ushakov Island, which was the last piece of undiscovered territory in the Russian Arctic, was named after him. Ushakov was awarded the Order of Lenin, two other orders, and a number of medals. ^ Biography of G. A. Ushakov at Polar World. Mikoyan Bay, is a bay in Severnaya Zemlya, Krasnoyarsk Krai, Russia. It is clogged by ice most of the year with many icebergs in the strait off the mouth of the bay. Krenkel Bay, is a bay in Severnaya Zemlya, Krasnoyarsk Krai, Russia. The Academy of Sciences Glacier, is a large ice cap on Komsomolets Island, Severnaya Zemlya, Russian Federation. Zhuravlev Bay, is a bay in Severnaya Zemlya, Krasnoyarsk Krai, Russia. This bay is blocked by ice most of the year. Cape October is a headland in Severnaya Zemlya, Russia.